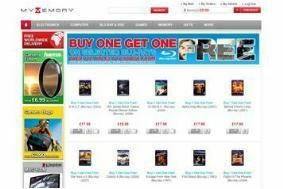 HOT DEALS: Buy one, get one free on Blu-ray discs from MyMemory | What Hi-Fi? Titles available include District 9, Terminator 4: Salvation, Angels & Demons, The Taking of Pelham 123 and Moon. You'll typically pay between £15 and £20 for two discs. Standard delivery is by UK First Class post. There are some even better deals in the HMV sale, with individual Blu-ray discs from just £7 and BD boxsets from around £18.